Kenosha HOG Chapter – Chapter 5559 sponsored by Uke's Harley-Davidson Inc. Welcome to the Kenosha HOG Chapter Website! We hope you find the information you’re looking for and enjoy your visit. Kenosha HOG was founded in 1988 with approximately 35 original members. We currently have approximately 250 members from Southern Wisconsin and Northern Illinois. We are fortunate to be sponsored by Uke’s Harley Davidson in Kenosha Wisconsin. Uke’s owner, Keith Ulicki and his wife Nanc are also active in our chapter. 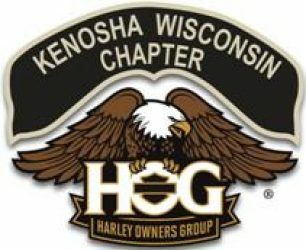 Kenosha HOG is a riding chapter. We plan our activities around riding and having fun! Any National HOG member is eligible, and joining the chapter is a great way to meet people just like you, who have a passion for riding Harley Davidson Motorcycles. We have well planned group rides every week throughout the season for all types of riders. Members can join us for an evening dinner ride, or an overnight trip, and everything in between. See the Membership page for details on how to join our chapter, and see some examples of our group rides on the Chapter Events page. All of our rides and events can be found on the Calendar but check it often because new rides and activities are added throughout the riding season. Our Meetings are held the second Sunday of every month starting at 10am. Check the Calendar to verify the location, which changes depending on the month. Meetings last about an hour, and are an opportunity to visit with friends and meet new members. We’ll give you the latest news on the chapter, reports from officers, information about upcoming rides and even share safety tips. It’s also an opportunity for members to provide input and suggestions to make our chapter the best it can be, so we hope to see you there! When we aren’t riding, we are having fun as a chapter getting together for annual events such as the Polar Bear Breakfast, Bowling Tournament, Chili Cook off, Summer Picnic, Uke’s Open Houses, and our Christmas Party which finishes off the year with a great meal and a good time with friends. Visit the Chapter Events page for more information about our Main Events and find out how to earn a Chapter Event Pin. If you aren’t a member yet, we hope you decide to join soon! In the meantime…Ride and Have Fun! Ready to meet some great people who love riding Motorcycles as much as you do? Do you like to Ride and Have Fun?… Then we would like to invite you to become a member of the Kenosha HOG Chapter! Joining is easy. All National HOG Members and Associate Members are eligible to join our local chapter. Click on the Membership Enrollment link to print and fill out the form needed to join for the first time or to renew your membership, which starts in January each year. Each Member needs to fill out the form whether a Full or Associate Member. Dues are $25 for a Full Member and $20 for an Associate Member per year. You can either mail your completed application to: Uke’s Harley Davidson, 5595 120th Ave, Kenosha Wisconsin 53144, drop iit off at Uke’s Harley Davidson, or bring it with you to the next Chapter Meeting. Check the Calendar for the exact meeting date and time. How do you get to know other Chapter Members? Walking into a meeting with a lot of people can be intimidating, but we all have a common interest…riding and having fun! One of the best ways to get to know people is to volunteer to help out at a Chapter function or on a committee. Don’t want to volunteer? Join us on a ride, big or small depending on your comfort level. The Bike Blessing draws over 1500 bikes and is our largest ride, but weekly stamp book rides usually have less than 15 riders. If you’re new to group riding, make sure you join Bob Clampit, our Safety Officer for a New Member Ride. Bob goes over Group Riding skills and then leads a local ride to offer new members some experience riding with others. There are several New Member Rides scheduled after Chapter Meetings so check the Calendar for dates and times or reach out to Bob. You also will want to review the Group Riding section on our Safety page. Some of our events and rides are “Open” to anyone including non-members. If you are not a member of our Chapter, you must sign an Event Release form in order to participate. The Calendar will designate if an event is “Open” or “Closed” to non-members. “Closed” rides do allow guests to accompany a member, with a signed Event Release. Minors under the age of 18 must have their parent or guardian sign the Event Release Minors form in order for them to participate. Click on the links to the left to print either form, fill it out, and bring it with you to the event. Meetings are held the second Sunday of each month and are full of valuable information for all of our members. Make sure you check the Calendar for the exact place and time, as it does change depending on the month. At each meeting there will be a sign in sheet by the door. Don’t forget to sign in so you get credit for attending and can earn your Chapter Event Pin. See the Chapter Events page for details. You can show your pride by outfitting your vest or jacket with the HOG Logo and Kenosha Chapter Rocker. For many HOG members, their vest or jacket becomes a record of all the places they have been and events they attend. Our store has patches and pins for sale at each of the Chapter Meetings, so be sure and check out what’s available, see Kevin for any purchases. Our monthly Newsletter is called HOG Breath. Our Editor, April Dean, gathers information from Officers and members to write it each month, and sends it out by email. Anytime you have an article you would like to include in the Newsletter, just send it to April and she’ll take care of it for you. You can also find the current and past issues on the Members Only section by logging in. Gean, is our Activities Officer and comes up with some fun activities throughout the year. The calendar is a team effort on the board, but be sure to keep an eye on it to stay current with the latest events. Joan Lesko, our Sunshine Lady keeps track of our birthdays and anniversaries, making sure they are remembered in our Newsletter each month. Don’t forget to include your special dates on your Membership Enrollment Form! Kenosha HOG Chapter Members are given a User Name and Password when joining or renewing their membership each year. The Members Only section has our current and past Newsletters, a Members Photo Gallery and other information that can be accessed by signing in. If you need the User Name or Password, contact Gary Quedenfeld, our Membership Officer.